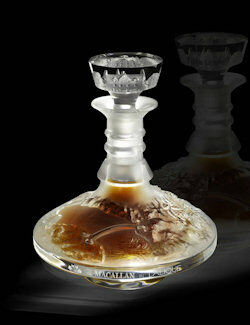 NEW YORK, Nov. 16, 2010: Yesterday evening, The Macallan and Lalique set a record for a bottle of whisky sold at auction and all of the proceeds will go to charity: water. Coveted by bidders around the world, The Macallan® 64 Year Old in Lalique: Cire Perdue sold for $460,000 (£288,000) in a lively auction at Sotheby’s in New York City. This sale represents the most unique collaboration to date between The Macallan® and Lalique, with 100 percent of the proceeds benefitting charity: water, an organization that provides access to clean, safe drinking water to people in developing nations. Lalique’s bespoke, one-of-a kind crystal decanter, created using the “cire perdue” or “lost wax” method, houses the oldest and rarest Macallan ever bottled by the legendary distillery, a 64-year-old single malt whisky. This remarkable combination has been on a 12-city “tour du monde” since April, and each stop along the way has raised funds and awareness for charity: water. Since April 2010, The Macallan and Lalique have raised approximately $605,000 to benefit charity: water, a sum that will change the lives of 30,250 people (www.charitywater.org/themacallan). The Cire Perdue decanter has visited the following cities worldwide, raising thousands of dollars at each event.